Listed below are the people who have answered Jana's Call to Action. These ordinary citizens have stepped forward and committed their time, efforts and talents in multiple ways to serve others. Inspired by Jana's life and courage, and motivated to action by her death, these people are "walking the walk". We hope these individual stories would encourage you to join our movement and make a difference. While Jana fought hard for the causes that were closest to her heart, she was first and foremost an advocate for community service in all its forms. This web site and this campaign is about encouraging people to make their neighborhoods and communities a better place. Find a place and get involved! Need help getting started? Please contact us with your stories of community service or advocacy. If you are moved to action because of Jana's life and death, or committed to service by others who are motivated by Jana's legacy, please let us know. Please provide your name, brief description of your volunteer activity or event, email, and contact information by clicking here. The Eleven Hundred Torches volunteer team will review your torch submission and will contact you prior to placing your torch on the website. 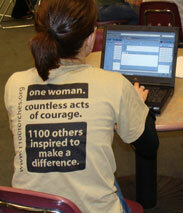 1232 Laura Wade Knowing Jana in college inspired Laura to get more involved in women's issues. In memory of her life's work, Laura now represents victims of domestic violence on a pro bono basis in Miami-Dade County Florida. 1231 Sarah Lockwood Inspired by Jana's life of dedication to volunteerism and advocacy, Sarah plans to make awareness and prevention of violence a priority in her home community. Faelynn In honor of Jana and her legacy, 21 girl scouts form different communities in western Kansas are dedicated to providing awareness about teen dating violence and domestic violence. 1157 Jessica States In honor of Jana, I joined Handmade Especially For You, a group that knits "comfort scarves" for abused women. I wasn't a friend of Jana's, but I do remember her from school. I wasn't popular or pretty or even her acquaintance, but she would always smile at me. I'll remember her smile every time I knit a scarf and hope that what I'm doing helps fill a bit of the void left by Jana's death. 1050 Darrell Hamlin To honor Jana and participate in this campaign, Darrell is collaborating with Christie and Curt Brungardt (Jana’s mother and stepfather) to write a manuscript about Jana’s life and her legacy. Darrell hopes that once published, this book will motivate thousands of people to serve others and also bring important public awareness to the issues of domestic violence. "I have also tried to honor Jana's life by answering the call to service with my position at Seaman Freshman Center in Topeka. With the inception of a new school, it gave me the opportunity to implement new ideas and start new traditions. The following is what I would like to submit to 1100 Torches, as we try and carry Jana's cry for service and instill those values in the young men and women that pass through our hallways." "For the past 2 years, a part of my job at TMP-M has been to organized an all-school service day—a concept that is not foreign to many communities nationally and an activity that is taught in many university leadership courses. Here at TMP-M, individual students are required to generate 20 hours of service each semester within the community, school and church, a principle and something our school values very highly. However, as many people know when something is made a requirement, very often people will go through the motions and put in the least effort. This year we upped the ante or better described by one of my students who coined our motto—S.T.E.P. up—we took our service learning day to a new level of Striving To Encourage People. Our goal is to renew the understanding of service, create a sense of inspiration and enthusiasm and generate new acts of service. On April 20, 2009, with twenty-six projects in the community and six school projects, the entire student body and faculty participated in a variety of activities that included cleaning, landscaping and yard work, painting, reading to children, crafts, singing and games, thank you card writing, office work and poster hanging—events that touched organizations, businesses and individual citizens. Planning the day gave me the opportunity to delegate jobs to students in my leadership class that helped in the organizing of the day as well as provided students and faculty with an experience of three hours of service within the community. To honor Jana and participate in this campaign, Alesha has integrated a service-learning component into her Political Science course at the University of Kansas. In her class Politics of Reproductive Policy, students are encouraged to find a place in the Lawrence area to provide community service. 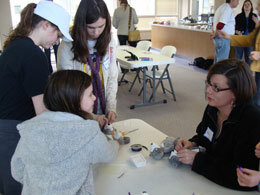 "This spring semester 2009 I have been teaching a course, the Politics of Reproductive Policy. Inspired by Jana, I decided to bring back a service learning component in my class. I provided students with the option of working in the community with a women's rights related group or completing a paper. Out of the 24 students enrolled in the course, 20 of them opted to complete a community project (I required 25 hours of service in their choice of organizations over the course of the semester). This has been the most rewarding teaching semester I have had the honor of experiencing at KU. My students' experiences and willingness to become involved has been inspiring and I credit this chain of events to your daughter's legacy. I will be making this a permanent aspect of my Reproductive Policy course and every time I teach it I am going to include Jana's story in my syllabus so that my students will continue to be inspired by your daughter as well. Thank you so much for so generously sharing your daughter's life with so many of us. Ernestine Thorne On March 8th, “Jana Mackey Day in Kansas,” 50 volunteers partnered with the Ellis County Chapter of the American Red Cross. 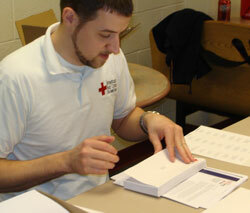 At the Red Cross office the volunteers started compiling a resource scrapbook, stuffed envelopes and flyers on behalf of Red Cross Month. 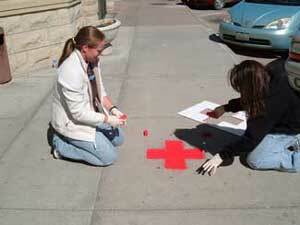 As another promotion of Red Cross month, some volunteers chalked “red crosses” on the sidewalks in front of local businesses, and other volunteers cleaned up the KDOT building, which houses Red Cross’s supplies. My torch is with the kids. 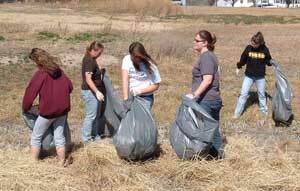 I started volunteering as a freshman football coach around the time of Jana's murder. My original mission at first was to teach the kids to always think (about everything) and to have fun playing a game by not taking it too seriously. I think kids, and adults, need this balance in sports and in many forms of entertainment. As a society, we are fixated on athletes and thus, a large number of kids really push themselves to satisfy that fixation, whether it's theirs, their parents, etc. 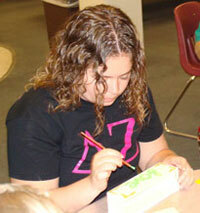 However, when Jana passed, volunteering became something more. I thought more and more about her fight for fairness and equality for all. Mainly, I thought of her fight against violence, because it was a product of this violent society that took her; a beautiful non-conformist in the truest and most tolerant sense. I now look at my coaching opportunity as one to address this violence among the young men that I mentor. In fact, the love for violence is duly noted, and admired in football, which contributes to many problems in the kid's lives. We all know this, but do we know how many of these kids grow up to be abusive/violent? Because of Jana, I've realized that I need to stand against that mentality, especially in an inner-city school where many kids are faced with violence within their lives and not just on the football field. 205 Abby Westfall-Allender Jana has inspired Abby to create a new program/website that helps generate funds for 1100 Torches and other like non-profits. Abby's activities also help link potential advocates with causes and organizations - Washington D.C.
198 Kim In honor of Jana, Kim will continue to fight and rise above her own domestic abuse. She will finish her book on the topic which relates her story in hope it will serve as a testimony for others to continue the fight. 113 Hilah Hilah was deeply moved by Jana's death, even though she never met her. As a victim of sexual assault, Hilah is now committed to helping other victims of sexual assault and domestic violence. 073 Peter Nye Peter has committed himself to volunteering in the Lawrence, Kansas area. 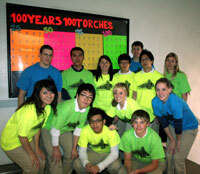 His recent volunteerism includes fundraising efforts for the 1100 Torches National Campaign - Lawrence, KS. 029 Samantha Snyder In Jana's honor, Samantha has agreed to be the Reproductive Justice Coordinator for KU's Commission on the Status of Women. Prior to Jana's death, Sam had declined this request. Upon hearing the call to action at Jana's funeral, Sam reconsidered and accepted the position.